I need an antenna in the U-NII-4 spectrum. This means the signal is in the range of 5.850 GHz up to 5.925 GHz. The center frequency is 5.887 GHz. Let’s build an antenna for this frequency. The size of (elements of) an antenna is often related to the wavelength. For instance the elements of a 1/2 wave dipole antenna is half a wavelength in size. The wavelength is the distance a radiowave travels during one cycle. Now the speed of light is 299792458 meters per second. Now there is a catch, it is the speed in vacuum. When making an antenna, it is probably not constructed in a vacuum. 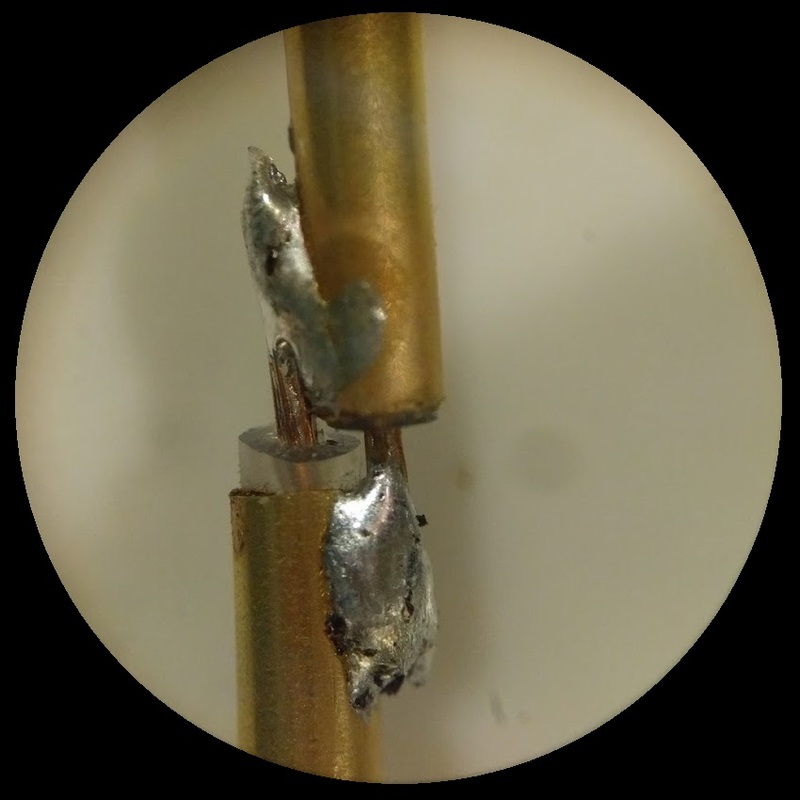 When using a coax, the substance the wave travels through is the dielectrum insulator. This is the substance between the centre core and the metallic shield. The Velocity Factor (VF) also called wave propagation speed or Velocity of Propagation (VoP) of a transmission speed is defined as follows: The ratio of the speed which a wavefront (i.e. radio signal) passes through the medium compared to the speed of light in a vacuum. The speed of a radio signal in vacuum is the same as the speed of light in a vacuum, which makes the Velocity Factor 1.0. When an antenna is tuned for sending you can assume it is also tuned for receiving. It would be nice to measure this. There is a device called Voltage Standing Wave Ratio meter often called SWR meter. This measures the impedance matching between the signal source and the antenna. When there is an impedance mismatch, this results in a standing wave along the transmission line. The ideal VSWR is 1:1. This optimum condition exists only when the load (antenna) has an identical impedance as the transmission line (Coaxial cable). Also the load should be free of inductance and/or capacitance. Good luck with that 😉 Any other situation results in voltage and current fluctuations along the transmission line. Now we handled the basic things we need to know we continue with the actual measuring of the performance of the antenna. With the SWR meter we can determine the SWR value of a known frequency. When we measure different frequencies, we can make a plot which frequency gives the optimal SWR value. The measured points can be plot in a chart. This reveals the optimum frequency for the antenna. For this moment this is still my theory, but I will try to confirm this by actually doing it. How do I get a signal source which is sending in the frequency domain I am interested in. It would be nice if the resolution is high to capture a proper curve. The TS5823 has 200 mW transmit power and has 32 channels in the range 5645 Mhz till 5945 Mhz. The maximum frequency step is 22 Mhz so this is an ideal candidate to test a curve with. Looking at the frequencies it is possible to downsize the amount of channels where the frequency step is between 18 and 22 Mhz. This has a more consistent spread and it reduces the amount of channels to 16. 250 channel fpv receiver with spectrum analyzer which points to the fpv_receiver_module﻿ sourcecode on Github. 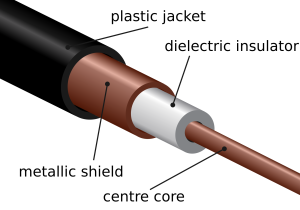 This article uses material from the Wikipedia articles “Coaxial_cable” and “Speed of light”, which are released under the Creative Commons Attribution-Share-Alike License 3.0.